My parents were wine collectors as I grew up, so I had some familiarity with the industry as a child, but heavily focused on California. Professionally, my first job that was really wine focused was at Ford’s Colony Country Club in Williamsburg, Virginia. Chef David Everett who was there at the time was one of my first mentors in restaurants, the first person to give me an opportunity to really learn, and still one of the best chefs I’ve ever worked for. I also met early on, and later traveled in France with Robert Kacher, who really opened the door for me with regards to French wines in particular, but also old-world wines in a more general sense. I think that we sometimes forget that being a sommelier is primarily about service. 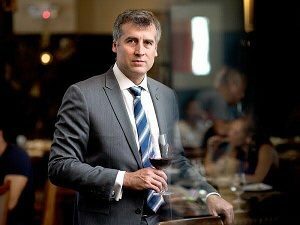 The ability to connect with guests, really listen to what they want and like, and make them feel comfortable with your suggestions is the heart of what makes someone a great sommelier. That takes a perfect blend of soft-spoken humility with tremendous knowledge to back it up. All the knowledge, physical skills, etc. are only useful if you can utilize them in enhancing the guest’s experience. Here in New York, two people come to mind as examples of this, Kyung Moon Kim and Scott Carney, both Master Sommeliers. Keep an open mind and remember that learning the craft of being a sommelier also requires knowing the whole restaurant from busboys and dishwashers all the way to the Chef and Maitre’d. All of the aspects of service have to work in concert for any of them to be fully successful. Learn from anyone and everyone, taste as much as you can lay your hands on. As far as finding a job, it helps to find mentors. Doing the little extra things and helping when it’s not really required will often attract the attention of a senior person and they can teach but also help professionally. The community of young sommeliers, especially here in the US, is now really strong. Social Media and tasting groups these days are often a great way of finding out about job opportunities. For me, it’s always a balance between what I think would be best for their meal and what the guest likes and is comfortable with in both style and price. I often am more conservative with a first-time guest and less likely to take them to something out of their experience in hopes of winning their trust. When I know them a little better, I can sell a more expensive or more unusual wine. At the end of the day, our job is to get wine into their glass that they like. Of course the meal will have an impact on what to choose, but that’s our job to take into account and we shouldn’t impose our own tastes and give them something that is “right for the dish” that they dislike. It’s important to listen to the guest and try to figure out what they will like by asking questions and letting them taste things if possible. Of course I think good glasses are very important. I do think the rush to make them as big as possible is perhaps a bit out of control. I don’t really want a glass with a liter capacity, it’s just too big for my taste, but some size is necessary for certain wines (Red Burgundy, for instance) Frustratingly, the glasses I like best are expensive and, in the restaurant, budget and breakage rates are always an important consideration. The best glasses for me at this point are some of the brands that are well-known and used by many sommeliers, Zalto and Riedel. I use Riedel at home everyday because even in our house, the Zaltos are often just too fragile. For the restaurant, I use Schott-Zwiesel because they are a little tougher and they tend to survive the commercial glasswasher better. However, I’m always open to something new. Much like I said for a young sommelier, keep an open mind. I work with Indian cuisine, and I see all the time guests who insist on a big, tannic red wine with a curry just because it has lamb or goat in it. (Red meat with red wine, right?) For me, that big wine will be much too bitter for a lamb curry which doesn’t have adequate fat or salt to balance the bitterness of the tannin. I’d rather put a Wachauer Gruner Veltliner Federspiel with that dish. I just love how the acidity and white pepper notes burst the masala into life and it’ll actually even cool the spice a bit even without sugar. Wine should enhance the dish, and vice-versa. Great pairings can often surprise you and it’s important to experiment, and when you find things that work, try to figure out why. I always do, but I understand why some prefer not to. For me, I return to the old perspective that part of what I’m paid for is to know the wines. I tasted the wine I sold to the last guest, and that’s why I can speak with authority on how this bottle is going to show tonight for the next. Guests depend on us for knowledge, and it must be a bit of a give and take. If a Sommelier cannot taste, then they will never know the wines as well. And of course, we will catch corked and flawed bottles that the guest might not. Since I do know how the wine is supposed to taste, I can make sure that the guest is getting exactly what I and the winemaker intend. In the United States, one of the best resources is the Guild of Sommeliers, run by the American chapter of the Court of Master Sommeliers. It’s a good place to start. There’s a jobs board there, but it’s really all about the community. Many sommelier jobs still crop up on the old standbys, CraigsList and Backpage, but CulinaryAgents.com is another favorite of mine and many of the top restaurants here in New York post their open positions there. Fair pricing is definitely one thing that’s crucial, but I think one of the worst errors that’s made is wine programs that fail to understand the context of the restaurant they are in. A restaurant has a Provencal chef and the wine director thinks Provencal wines aren’t cool enough and puts together a list of all Bordeaux, Burgundy, and Loire. A by the glass program in an Italian restaurant has 75% French wines, or a restaurant where the entrees average an affordable $25-$30 and there’s no wine under $150 on the list, etc. Sometimes you get a sommelier who refuses to put any “mass market” wines on the list and ends up with a list of obscure wines that intimidates and turns off their guests. A wine list is an integral part of the concept of the restaurant and should be consistent with the brand of the restaurant and it’s clientele, neighborhood, etc. It should be interesting and represent quality, but not sacrifice accessibility. As for markups, it’s gotten much easier for guests to see whether the pricing is fair. It takes just a few seconds to spot check a few wines against local retail prices using winesearcher.com, vivino, or any of a host of other apps and see what kind of markup the restaurant is using. Sommeliers need to understand that the days of getting away with extreme markups are in the past. You must assume that your guest knows what the fair price for the wine is. Customers need to understand the context too, however, in that what constitutes a fair markup will be different depending on business costs in a particular city, or country. What’s fair in London isn’t the same as New York, and that’s definitely not the same as what’s fair in Peoria, IL. Taste, taste, taste. In New York, the market is so competitive and there are so many choices that you cannot expect me to be able to consider everything and there’s almost no way I’ll buy something I haven’t tasted. Producers need to choose carefully who represents them in the market, as each distributor has their strengths and weaknesses and clients where they are most influential. Getting onto my list will almost always require getting the local representative to make an appointment with me and have me taste the wines. However, since I get 10-15 or more requests a week and have time for only a fraction of those, it can be difficult. Zinfandel. It’s the quintessential American wine and kind of reflects something of the American character. It may lack old-world pedigree, but it’s unapologetic, spicy, dynamic, and not afraid to have an opinion. I drink tons of Austrian wine, especially Gruner Veltliner and Riesling from Wachau. It’s unsurprising really, as my wife is from Wachau, although it’s actually my love of Austrian wine that helped us to meet in the first place. I was raised in California as the son of wine collectors, and I still love the taste of the classic California vintages of the 1970s and 1980s that I grew up on. We always have a few bottles of some old Napa Cab in the house, and I love drinking them and sharing them with guests. And lastly, I’m obsessed with Madeira. I rarely go a day without a glass of Madeira, and it would have to be my desert island wine as there’s no way I would give it up for anything else. Since I’m a sucker for Terrantez, may I have to my desert island please an unlimited supply of H.M. Borges Terrantez 1846? If so, I’ll volunteer for the island now. I’ve mentioned a few.. winesearcher.com is a great resource here in the USA, I’m not sure how effective a tool it is in Europe. I’ll also mention again the website from the Guild of Sommeliers, GuildSomm.com. It is probably the most comprehensive and accurate source for world-wide wine law, appellation law, classifications, etc. that exists online at the current time.